And so it begins… mechanics and London to Brighton! Though I have had this plan on the cards for a little while, I have finally told my mum which means I’m ready to blog! I didn’t get a negative reaction but she was full of cold, so I will wait for the onslaught of questions. I’m sure grandma will tell me what a ridiculous idea this is, even if my mum decides to show her full support!! The start of my ride in December seems a long way off but there’s so much to do and, coupled with a burgeoning teaching commitment and a role in the local am dram version of Jesus Christ Superstar, time seems to be a somewhat challenging commodity to obtain in my life. Saturday saw the arrival of my first ever clip-in SPD pedals, shoes to match and some padded, nappy leggings! It’s all getting a bit lycra in here and I’m not sure I like it. I don’t want people to think I’m any good at this just because I am beginning to look the part! At least the shoes are pretending to be trainers. After a full day of rehearsals, focusing on stage combat and dancing, I gathered my tools and cycling weekly guides and set about fitting my pedals and sorting out my saddle position. Very technical and precise, I can assure you; I even used a tape measure. I was definitely ready for my bed at the end of the day – surely enough training for the weekend? Well… in a word… no. Sunday saw my manual labour turn into physical graft and, following a quick whizz up and down my street to check I wasn’t going to kill myself with the cleats, I barrelled off into the unknown towards Brighton. Following the detailed directions on Cycling Routes was a little challenging at points, especially as I had forgotten my printed version and had to flip constantly between maps and my notes… However, the route was excellent and it was great to have an idea of what was coming up. I even managed to conduct a brief litter pick on one of my direction checks. Good deed done. Most of the ride is fairly easy with a few climbs rewarding you with daring downhill sections – according to Strava, I managed a hair raising 41mph before bottling it and applying the brakes. The Bike Who Has No Name (we aren’t at that stage in the relationship yet. I still have feelings for Bobby) was not built for such plucky speeds but I felt like a pro tucking myself into a crouch and letting go for that brief moment! In the tiny village of Copthorne, I draped myself across a bench to guzzle my yellow label feast (always about the bargains) to try and stave off the ‘bonk’, which is apparently how we cyclists refer to ‘hitting the wall’. Clipping into my pedals, I felt a wave of trepidation as I prepared myself mentally for Turner’s Hill which was supposed to be the second most challenging of the ride. Without even leaving my second set of gears, I was approaching the summit thinking, “surely that can’t be it?” but incredibly, it was and I sped off on a luxurious descent thinking that I was going to gobble up that green monster with gusto! When I first caught a glimpse of the ridge however, my heart dropped. I felt that, after fifty miles of cycling, there was absolutely no chance I would get over that beast. I began chuntering under my breath and wishing my iPod would switch itself to something a little more inspiring. At the turnoff signposting Brighton straight on and ‘The Beacon’ to the left, I strengthened my resolve and took the turning. To be honest, I’m surprised that none of the oncoming cars stopped once they’d seen my face which was a delightful shade of puce and contorted somewhere between a grimace and an all out scream. Rounding the second switch back, I was rewarded with a thinning of the trees, giving me a much needed boost as I was crawling steadily higher in first gear. I even clicked one up into second in case I needed a further push a little higher. As the trees gave way, I met my first ever weather friend – a tail wind. In over five hundred miles of cycling I’ve never experienced the phenomenon and here it was when my need was at its greatest. After one tiny kiss of that tail breeze, it stopped and I wailed into the countryside like a manic midwife, “Please! Just one more push!” And miraculously one more minute rustle of air was enough to raise my spirits and get me to dig in all of the way to the top. Had I not been clipped in, I think I might have crumbled and pushed and, as I stopped, my legs wobbled unsteadily whilst I pulled myself together and grabbed the nearest rambler to take photographic evidence of my beetroot face at the top of my first real hill. I’d made it. During the ride, my mobile and I had been battling it out to see which would crumble first. At the top of Ditchling Beacon, the grubby fingers of my new hiking friend proved a little too much and my phone abandoned me to attempt to find my friend’s house without map or technology… YEY! There was only one thing for it – head downhill at all costs. Fortunately, I am not averse to asking for directions and paused a couple of times en route to check that my nose was pointing me in the right direction. 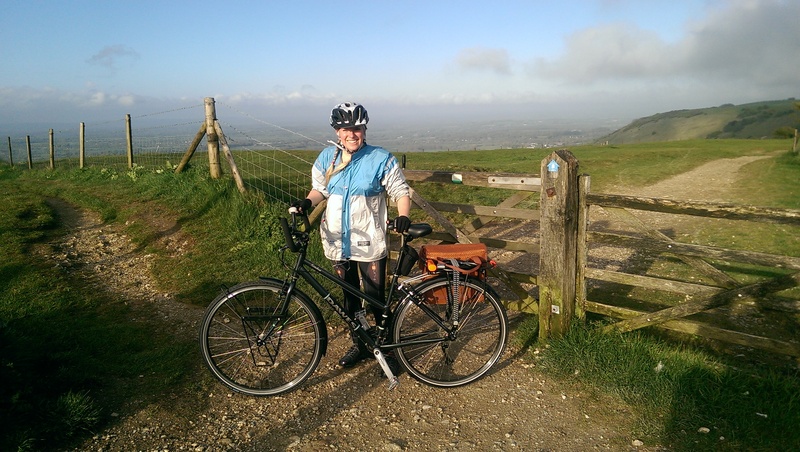 Reassuringly for my novice look, the group at the first pub responded with, “oooh, that’s a long way!” Knowing that it must only be a couple of miles, I let it slip that I’d come all of the way from London as I clipped back in and heard some rewarding gasps as I pedalled away. I couldn’t have asked for a better host than Helen and, as I collapsed into her flat, she proceeded to feed and water me in a supreme fashion. 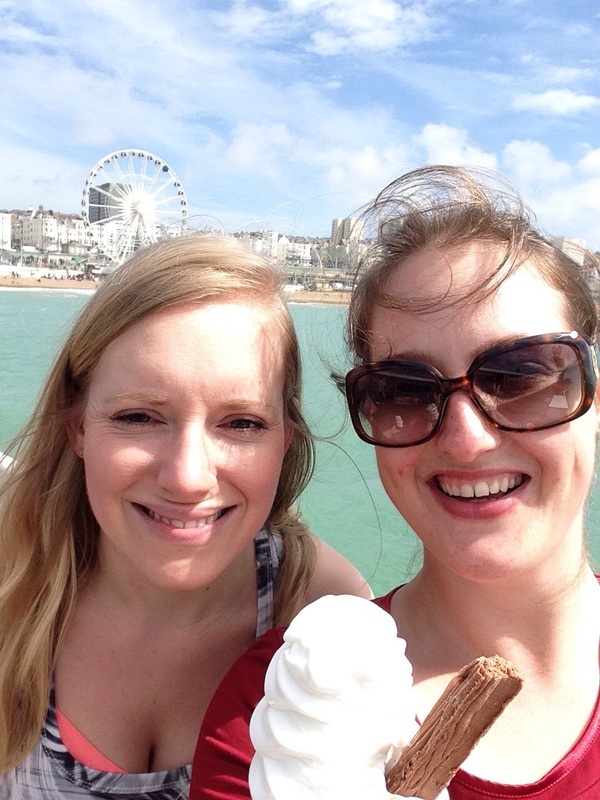 The next day we bought ice creams at the pier and the pains of the day before seemed a million miles away. As soon as I find a way of protecting my nether regions from pain beyond compare, I know I am going to love this.